I was so distracted by the trip I took this month that I completely forgot to post for Blog Action Day (which was on October 16). So here is what I would have said, had I been less distracted, and more alert. Food is good. Next to air and water, it’s an essential. And yet, too many people around the world, and in my own country which is known for abundance, have too little to eat. It’s not just that they can’t afford the food, sometimes it is that food that nourishes is simply unavailable, as in many places where drought, flood and other weather problems have destroyed the crops or livestock on which people depend. It may be that there is abundant growth in the fields, but not food crops: many farms have switched to corn and other plants that are used in fuel rather than as food. And, it may be that the food that is grown locally is shipped elsewhere, around the world, so that the local people don’t have access. Could it be that there is really too little food for our world? We just passed the 7-billion-person mark. That’s more than twice as many people now alive on earth than there were when I was born. About 1.5 billion new people since my children were born. Check out the BBC’s online app “What Number are You?” I read today that by mid-century there will be as many people just in urban areas as were in the entire world about 100 years ago. That is, to me, a startling, alarming idea. People in cities generally lack the ability to grow food at all — they must rely on outside sources, so they are more vulnerable to fluctuations in supply, and more vulnerable to unscrupulous sellers who charge premiums on the foods that are available for sale. What can we do to provide food for more people? We are learning – too late – that when the climate changes we have very little ability to prevent weather-related crop losses. We are learning – too late – that when cropland is converted to industrial zones or suburbia it is very expensive and sometimes impossible to go back. We are learning – too late – that the more people there are on earth, the harder it is to keep fuel costs (both monetary and environmental) down, and the more expensive food and other necessities become. We are also learning that sometimes the old ways (pre-industrial) work best: Ranchers are returning to free-range practices that restore and preserve grasslands; farmers are returning to no-till (very labor intensive) and organic farming practices which can restore and maintain soil structure and health; urban people are beginning to think about living locally, eating what is in season rather than importing foods from around the world. We are learning that good food, healthy food needs to be available from an early age, so that children learn to eat and prepare healthy food and to avoid or minimize consumption of less-healthy food. We are learning that sometimes less can be more, when we eat foods closer to their natural state without added sugars and salts we tend to be healthier. I don’t have answers, or even any real suggestion this year. I do have a desire to make this world livable for my children and the rest of the planet. What can I do in my own life to promote healthy food for more people? When I grow food in my garden I can give some of it away to the food bank, necessary now more than at any other time in my life. When I prepare foods for my family I can use in-season, less-processed foods (which are both less expensive and healthier). When I participate in public debate about land use I can advocate for both open spaces and public gardens so more people can grow part of their own food. I can support organizations that help people in weather-stricken areas to eat for now and reclaim their croplands as soon as possible. I can do little things. If we all do little things, together, we can make a big difference in the health of the rest of the world. I think I have linked to this site in the past, but it’s a good illustration of the spread and impact of poverty around the globe. 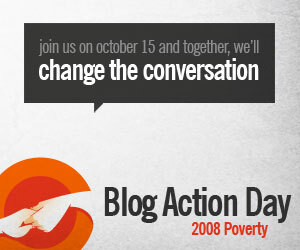 Poverty is the theme of Blog Action Day this time. What is poverty? There are many definitions, a lack of money being only one of them. Who around you lives in poverty? How would they define it?